A local newspaper is ‘fighting back’ in support of its town following an article in a national newspaper which claimed the area was being taken over by Eastern European drug gangs. Following the murder of Latvian teenager Alisa Dmitrijeva, who was found dead last month on the Queen’s Sandringham estate, the Daily Mail published a report about Wisbech, where she had been living before her death. The town’s local newspaper the Wisbech Standard’s is now defending the town, claiming its reputation has been sullied. 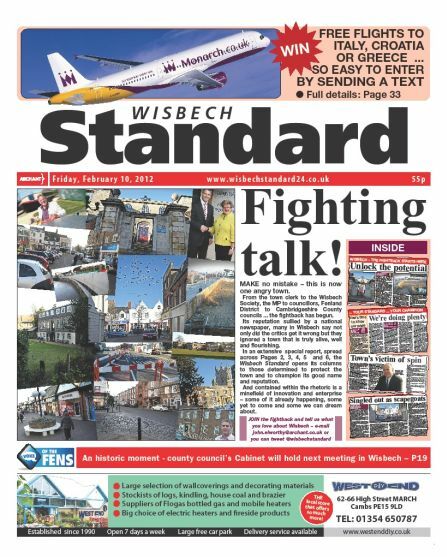 A front page story headlined ‘Fighting Talk’ reads: “From the town clerk to the Wisbech Society, the MP to councillors, Fenland District to Cambridgehsire County councils… the fightback has begun. The paper also included five pages featuring columns written by people determined to protect the town. And it revealed that following an invitation from Standard editor John Elworthy, Cambridgeshire County Council’s ruling cabinet has agreed to hold its next meeting in the town on 6 March. Said John: “Wisbech is a wonderful, Georgian town which you could say has become a bit blemished over the years so this is a great opportunity to help it turn a corner. Council leader Nick Clarke said he wanted to raise the profile and promote the positives of Wisbech, and said he also want as many councillors as possible to have an understanding of the issues facing the town. Archant, the parent company of the Wisbech Standard, will be hosting a breakfast at the Boathouse on the day for Cllr Clarke and his Cabinet colleague and other local dignitaries and civic leaders. The normally politically correct local BBC TV did an excellent piece on the problems in Wisbech. It was more in line with the Daily Mail story – as opposed to the see-no-evil attitude of the local paper which is looking at the town through rose tinted specs. The Wisbech Standard should be reflecting the views of its ordinary readers instead of self-promoting local politicians who want to pretend that the town is a lovely place. It is not. Pass the rose-tinted glasses. You’d think it was Trumpton. It’s admirable that the local paper is standing up and correcting slurs, instead of making them. Local papers should be supportive of their area, far too many make them look worse than they are. It’s easy to criticise, which is what 90% of front pages are. But how many make a stand and show the beautiful side of their patch? Not many.